The 1-room apartment is located in the attic and has a double bed (180x200, separate mattresses), 3 single beds (90x200), a dining area, a kitchenette and shower / WC. In addition, a lounge with a library and TV can be used. 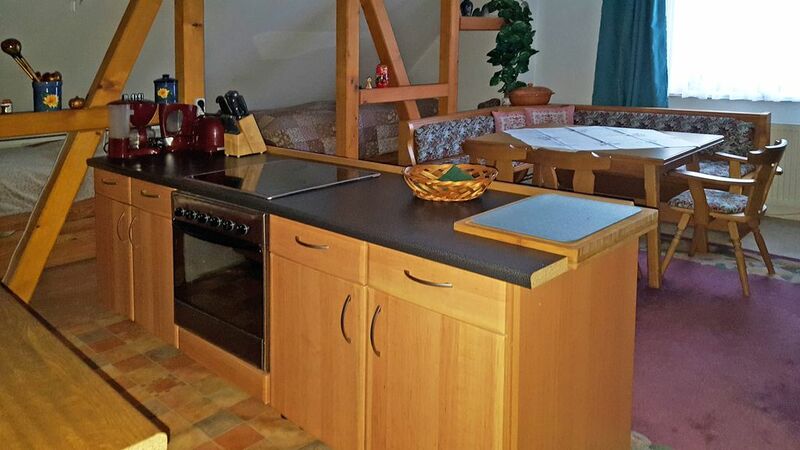 Because of the open stairs this property is not suitable for small children up to 3 years. The apartment Alte Schule in Langhagen has a separate entrance and is located in the attic of a residential building. It has a large living room / bedroom with double bed, 3 single beds, dining area, kitchenette and shower / WC. In addition, a lounge with a library and TV can be used. The large garden at the house can be shared. Here is also a beach chair available. The next place to swim is 1km. Because of the open stairs this property is not suitable for small children up to 3 years. You reach the apartment conveniently located on the A19 motorway Krakow / Teterow towards Teterow. Excursions made by all the lakes of the Mecklenburg Lake District. About the A19 can be reached in 30 minutes. Rostock and Warnemünde in 45 min. The lakes provide the locations of goods, Malchow, Plau and Rechlin to Fahrgastschifffahrt.